Being told you have a cavity can be a concern. However, most adults have missing or filled teeth, so it’s not uncommon. But what about if you’re experiencing more and more dental problems? From swollen gums to cavities and tooth grinding, these could actually be symptoms of a much bigger problem. Perhaps it’s time to listen to what your mouth is telling you? Bleeding gums isn’t just a sign you need to pay better attention to your dental health – it can be a symptom of type 2 diabetes. We all experience plaque build-up on our teeth throughout the day, but it you have a high blood glucose level then it creates the perfect conditions for this bacteria to grow, ultimately leading to sore, swollen and bleeding gums. If you persistently struggle with gum disease, are overweight and your diet consists of a high sugar content, then your dentist might suggest you get checked out for diabetes. This Diabetes Week, why not take the step to improve your diet for the health of your body and your teeth? If you wake with a stiff jaw, experience frequent popping or clicking, and even tooth tenderness, you might well be grinding or clenching your teeth in the night. This can be a result of stress which can also cause you to clench your jaw throughout the day without even realising it. Stress can also trigger canker sores or ulcers, while broken or fractured teeth can occur from excessive grinding. If this sounds familiar, you need to book a check-up with your dentist. Bad breath can take its toll on your social life. But if you’ve done everything you can think of and it still won’t go away, it could indicate a problem in your mouth. Either you’re experiencing chronic dry mouth, perhaps because you breathe through your mouth when awake or asleep, or you could have gastroesophageal reflux disease, also known as GERD. This is a condition where stomach acid finds its way into your mouth. Bad breath isn’t the only sign though. You’ll likely also notice more frequent cavities and sensitivity due to the acidity wearing away your enamel. As we age our bones lose density, which is a particular problem in women. However, calcium deficiency can also commonly affect those on a low or non-dairy diet like vegans and vegetarians. Unfortunately, it can result in tooth loosening and loss. If you have dentures, you might also find these become looser. A dental X-ray can identify bone density loss. Do you regularly suffer from a dry mouth, cavities and bad breath as well as dry eyes? The first culprit to suspect might be breathing through your mouth or other things like dehydration, using alcohol mouthwash, as well as medications and environmental issues. But if you’ve got these things in check, then Sjogren’s syndrome also creates these symptoms. This disease affects the glands which produce saliva and tears. Like Sjogren’s syndrome, celiac disease is another autoimmune disease with symptoms that manifest in the mouth as well as elsewhere. For celiacs, gluten causes damage to the small intestine, producing painful and debilitating gastrointestinal problems. But it can also cause spotting or discolouration on the tooth enamel, such as yellow, brown or white spots and a pitting or banding effect, often affecting the molars and incisors. That’s not all, you’ll likely get symptoms such as canker sores, a dry mouth and a red tongue which has a smooth (rather than rough) surface. If you’re experiencing any of these dental problems, it’s time to book yourself in for a check-up. 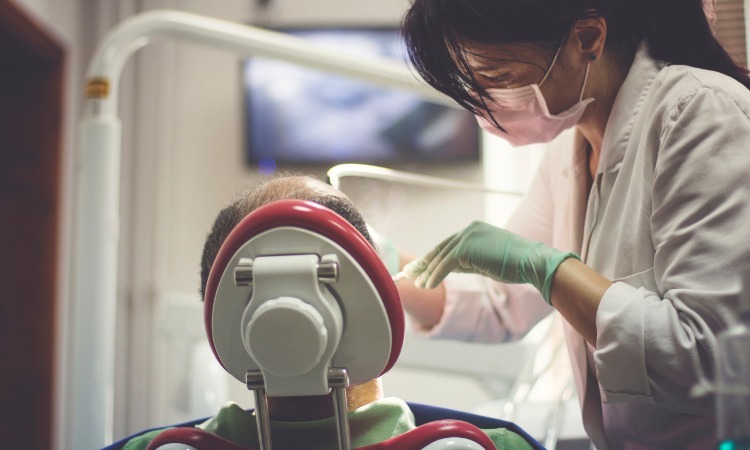 Our Notting Hill dentists and dental hygienists can take a look in your mouth to help treat the problem and offer dietary, lifestyle and brushing advice. If you have additional symptoms which you suspect might indicate one of these conditions, then it’s also important to book a GP appointment for a more thorough diagnosis. ← Is milk actually good for your teeth?